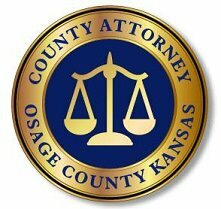 Cody R. Todd, 24, Osage City, was sentenced to 180 days in the Kansas Department of Corrections in Osage County District Court today. Todd was convicted and sentenced to an underlying 29-month prison sentence for a July 2014, non-residential burglary in rural Osage City. Todd also had his probation revoked, based upon the new conviction and condition violations on two previous felony convictions. Overall, Todd is facing 87 months in prison, but will have a final chance at probation after serving a 180-day sanction in the Kansas DOC. Also today, Brian K. Tompkins, 46, Delia, was sentenced to 120 days in the Kansas Department of Corrections after he was found in violation of his probation. Tompkins was originally convicted of criminal threat in March 2015 and sentenced to an underlying 16-month prison sentence in April 2015. He was placed on probation, but violated that probation, resulting in a prison sanction. The crime occurred September 2013 in Carbondale.